A perfect chill-out awaits you at places where the heat of the sun is on, big waves splash along the shore, soft white sand touch your feet, and a there’s a cold drink waiting for you when you get thirsty. Summer is about to begin so check your bikinis if they still fit you. Time for men to show their abs to the ladies in the island. Get away from the city, leave your business there, pack your bags, and travel around Singapore. Get ready for some big waves which will take you away. 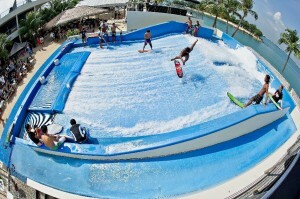 One of the best surfing areas aside from California, is the Wave House Sentosa. Here, there are two artificial wave simulators, the FlowRider and the FlowBarrel. But before you get along with the waves, boost your energy at the bar and have some cold drinks such as beer, classic margaritas, island tea, and etc. C-Side was recently launched with five distinct beachfront outlets, namely Coastes, Bikini Bar, Sand Bar, and Flame and Makan. Each venue offers a unique set of entertainment: Coastes offer a variety of drinks, food, entertainment, activities, and promotions. Bikini Bar is best for its well-known beach beer for the young ones, the Bintang. Aside from the youthful features of the bar, a resident DJ is on deck to jam with you together with his hip hop tunes, R&B themes, and other latest songs. Events such as the Beerkini fest, beach games, and crazy beer promotions will let guests enjoy. The Sand Bar is a casual cocktail reception with no shoes on. Serving beers and cocktails chilled with live music. The Flame is newly launched where hungry people can enjoy barbeque on the go. Makan also brings delicious delicacies to the seaside. Azzura Beach Club is a festive playground on the beach side with indoor and outdoor dining, nightclub space, and a swimming pool for hot travellers. Since Azzura is operating for the whole day, it serves casual food and drinks that will surely make you stay for longer hours. Play volleyball during daytime and visit The Harem Nightclub when the sun goes down. Enjoy the beautiful scenery at the Tanjong Beach Club. A lot of people would travel far just to get there. An all-day menu for breakfast, lunch, and dinner is perfectly served for you. A beach party with the coolest DJ on earth will give you a crazy night. Since Tanjong is one of the best, visit it at once and rock with young people even on your forties. Cancel your appointments today and dine with your family and friends at the Bora Bora Beach Club where barbeque, light snacks, and a western and local classics will surprise your day. This place is for people who wants to relax, unwind, and relieve the stress from work. There’s an indoor and outdoor terrace dining, a bar with a pool table, sun-loungers and tables along the shore. If the wonders of this nature is just a piece of land where we can chill and relax, well no one should leave the country without such experience like this.